North Korea boasted today it performed its first-ever nuclear weapons test, saying it detonated a successful underground blast in a “great leap forward” that defied international warnings against the communist regime. Prime Minister Manmohan Singh on Monday described the nuclear tests conducted by the Democratic Peoples Republic of Korea as an unfortunate development. North Korea’s first nuclear test in defiance of the international community has evoked widespread criticism from across the globe. The North Korean nuclear test was unique in its being announced before hand. In the case of China and Pakistan preparations for the tests were known to the world before hand. N-test conducted in mountain tunnel? Is the government doing enough to control the dengue epidemic? 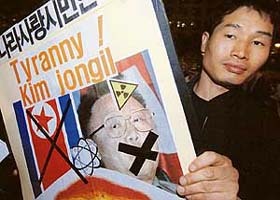 A protester holds an anti-North Korea placard during a rally in Seoul on Monday after North Korea announced it had conducted a nuclear test. The number of dengue cases reported from different parts of the country rose to 3,613 today, while the toll touched 50. According to the control room of the National Vector Borne Disease Control Programme, there has been an increase of 206 in the number of dengue cases reported since yesterday. Noted Sufi singer brothers Puran Chand Wadali and Pyare Lal Wadali and three members of their troupe were injured when their Tavera vehicle collided with a stationary truck on the Amritsar- Jalandhar road in the wee hours today. Punjab and Haryana will get 1,950 MW of power from two ultra-mega power projects, being set up by private players in Madhya Pradesh and Gujarat under the initiative of the Union Power Ministry and which are expected to be commissioned by 2012. Dalit leader Kanshi Ram, who passed away early this morning, was cremated in the afternoon amidst slogans from his followers at the Capital’s Nigam Bodh ghat. 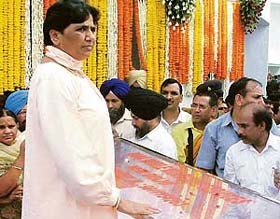 BSP leader Mayawati stands beside the body of Kanshi Ram at the BSP headquarters in New Delhi on Monday.